Click on the image to view a selection of photos from the game, courtesy of Fergus McNally. Bohemians had to settle for a point at home to Sligo Rovers on Friday night after both sides played out a 0-0 draw despite Bohs playing against ten men for a large period of the second half. 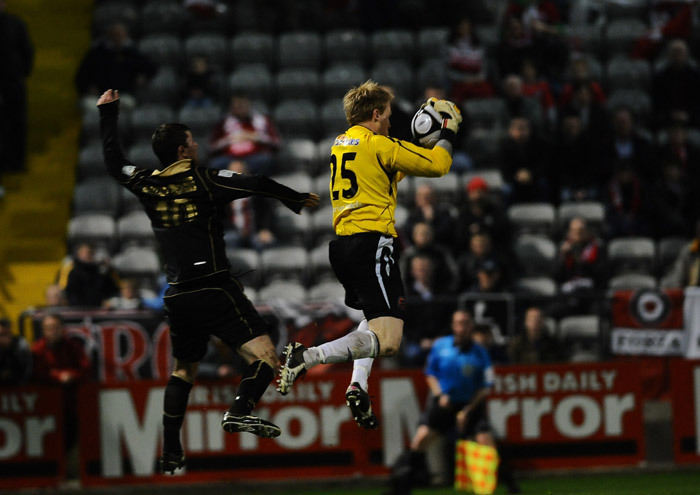 Bohs failed to find a breakthrough against a relentless Sligo side who fought hard despite their numerical disadvantage. The Gypsies seemed to lack the creativity needed to break down Paul Cook’s men and spurned chance after chance. Sligo almost got off to the perfect start when Padraig Amond had the ball in the net after just 36 second but the goal was ruled out for a handball from Amond just before he shot. The visitors started the better of the two teams and again came close in the 11th minute when Eoin Doyle played a neat one-two with John Dillon but Ken Oman denied the striker with a terrific challenge. 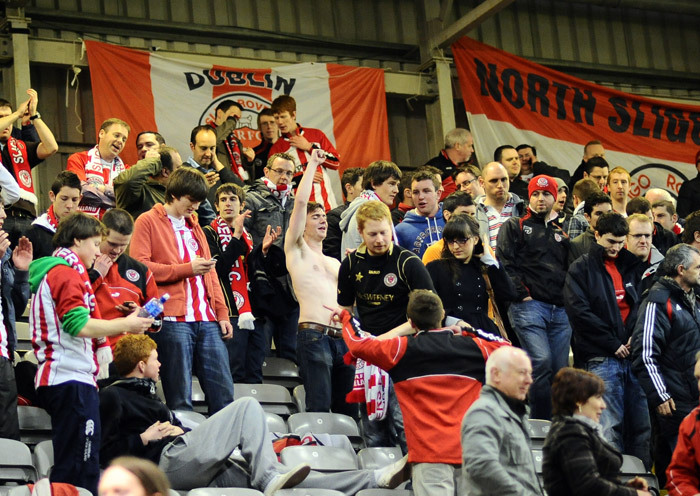 After a slow and somewhat nervy opening ten minutes Bohs began to dominate. Mark Rossiter, playing in an unfamiliar position on the right-wing, was proving difficult for Iarfhlaith Davoren and was providing plenty of crosses for Paddy Madden and Jason Byrne, none of which they could convert. Madden almost opened the scoring for the home side with what would have been a memorable strike. The young forward went on a surging run from the halfway line but shot narrowly wide from the edge of the box. His partner Byrne should have given Fenlon's side the lead in the 30th minute when he found himself one-on-one with Richard Brush after a through ball from Paul Keegan. However Brush was quick off his line to deny the striker. Sligo were causing Bohs problems from set-pieces and came close to scoring when Davoren headed just over from a Dillon corner. At the other end, Byrne was proving a handful for Gavin Peers in the heart of the Sligo defence and really should have scored in the first half. Byrne squandered a number of chances in the first half, the best being a volley from 12-yards that was brilliantly palmed away by Brush. Sligo’s game plan was severely hampered when they were reduced to 10 men in the 59th minute when Peers brought down Byrne who was running clean through on goal. It was a second yellow card for the centre- back, the first coming for a needless foul on Madden in the first half. Byrne took the resulting free-kick and yet again came close but his low drive was well held by Brush who was having a fine game in goal. Raffaele Cretaro came on in the 81st minute to face his former club, but not even he could find a breakthrough against a stubborn Sligo side. The former Sligo player was greeted with a frosty reception from the large Sligo travelling contingent who made plenty of noise all night. Jason Byrne won’t know how he failed to score and had another chance in the 92nd minute but his shot from 20-yards did little to trouble Brush. Byrne had another chance just seconds later when Mark Quigley’s cross found Byrne unmarked at the back post but his tame effort was straight at Brush. Bohs will be disappointed not to have claimed all three points from the game, while Sligo will be more than happy with the point after the sending-off of Peers. Next up for Bohs is an away fixture against bottom of the table Bray Wanderers while Sligo take on Drogheda United in Hunky Dorys Park. Bohemians: O’Connor; Heary (c), Powell, Oman, Shelley; Cronin (Higgins 76), McGlynn, Keegan, Rossiter (Quigley 76); Byrne, Madden (Cretaro 81). Subs not used: Greene, B. Murphy. Sligo Rovers: Brush; Ventre, Davoren, Peers, Keane; O’Grady, Dillon (McCabe 73), Ryan, Doyle; Blinkhorn, Amond (Almeida 72). Subs not used: Marshall, Doninger, Kelly. Extratime Man of the Match: Richard Brush.